According to the Steve Hoffman forums, 'KEV' is Kevin Reeves, who worked at Capitol Tower Mastering from 1985 through 1997. Does anyone have a picture of the center label, or know if there are two different center labels? 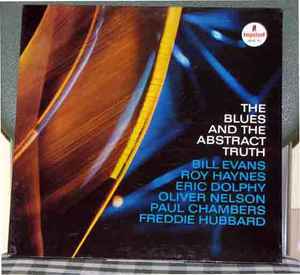 I see the description above, but mine doesn't match that, rather it matches the label pictured for this release: https://www.discogs.com/Oliver-Nelson-The-Blues-And-The-Abstract-Truth/release/4624523 I definitely have the original sleeve but am trying to figure out if someone switched a later pressing into the sleeve or if there were more than one pressing with the original sleeve. Thanks! I bought this vinyl for a small amount of money and i am very happy with it. The vinyl is without flaws. The sound is very good in my opinion. I know that DOL doesn't always do well in quality assessments ( mp3 files etc ). I personally have only had good experiences with vinyl from Dol so far. Unfortunately I have no sound comparison to original impulse editions. So that's my subjective opinion. The music itself by Oliver Nelson and co is outstanding. These recordings are the best Nelson has ever made. I appear to have a hybrid version of this lp: the label is similar to the original "abstract" version with "A Product of Am-Par Record Corp." in small white letters at the bottom of the orange Impulse-label (used from '60-'63), yet it has the cover of the version presented on this page, which by the way is not a 1961 pressing but earliest a 1963, since it has "A Product of ABC-Paramount Records Inc." printed at the bottom of the label, which was in use from '63-'66. How does this press sound? I'm looking into getting a good mono starter copy and this press seems to be most affordable. Thanks! I took a chance on this pressing & it sounds AWESOME! It has ALL the tubey magic of a vintage copy. I highly recommend it!!! I have an original Mono sleeve and I am looking for an original stereo sleeve. Please contact if you would like to trade. Man, this particular vinyl pressing (Nippon Columbia) sounds so good. It's one of the best Japanese pressings in my collection. Highly recommend! I like the quality of the gatefold cover too. When you think about the thousands of notes contained in a full-length jazz album, and how many chances there are to slip up — even just once — it may seem statistically impossible to record something without an off-note (and even if you could, would it be too sterile? This music needs some SOUL after all). Well, I think a few proven examples have surfaced over the years, and here's one that doesn't get mentioned nearly as much as the usual suspects. Sure, "Kind of Blue" often gets the crown of 'perfection', and then they'll mention "Blue Train", (but usually AFTER "A Love Supreme", which still baffles me) and maybe "Maiden Voyage" or "Somethin' Else", if they know what they're talking about — but you don't typically hear "The Blues And The Abstract Truth" brought up in those conversations. Oliver Nelson was a dedicated, passionate musical mind, but he was far more concerned with composure and orchestration than with spontaneity or improvisation. This makes some of his work a little dry, in my opinion. This 1961 Impulse! recording, on the other hand, smacks a home run. Fittingly released between Gil Evans' heavily orchestrated "Out Of The Cool" (Impulse A-4) and Coltrane's wildly unorthodox "Africa Brass" (Impulse A-6), there was a chemistry here that is hard to beat. I think that's an adequate enough front-sell, so let's forsake vain descriptions of the music itself, and simply let Nelson's hard work pay us a favor this time.